We look at the pyramids of Egypt excluding the unfinished ones and see civil engineering projects that had been successfully completed. The construction starts with preparations, namely: choosing the site, planning the project, providing for the supplies, their safe transportation and the methods of lifting the building blocks. Constructing a pyramid is a major civil engineering project. Pyramids are built on rock formations, conglomerate, gravel, or sand surfaces which are artificially leveled or unleveled. While it will be relatively easy to level the sand surface, it would be more difficult to level gravel and very difficult to level conglomerate and rock surfaces. The pyramid of Khufu ‘G1, is built on leveled rock, while his 'queens pyramids' especially ‘G1c, and the layer step pyramids at el Kula and Elephantine were built on an unleveled rock surface. The Pyramids of Khafra ‘G2, and Menkura ‘G3, are built on a leveled rock surface which had been extended by artificial terraces of megalithic blocks. The layer step pyramid of Snofru at Seila was built on an unleveled surface of Pliocene conglomerate. His pyramids at Dahshur are built on leveled gravel. At Meidum, the layer step pyramids of Sinki at Abydos, Nubt and El Ghanimiya, and the monuments were built on sand. When the monument is built on a rock or conglomerate unleveled surface the pyramid shape has to consider according to a datum line. Consequently there is a construction prior to reaching the datum line. Setting the orientation lines of the pyramid base or the datum level, would be by setting right angles to true directions. The north south direction is by observing the North Star and or by observing the rising and setting of a certain star on an artificial horizon. The east-west direction was by observing the equinox and/or by shadows of the sun light. At Giza with Khufu and Khafra we have marks of a series of approximations leading to the perfect orientation of the pyramid base. 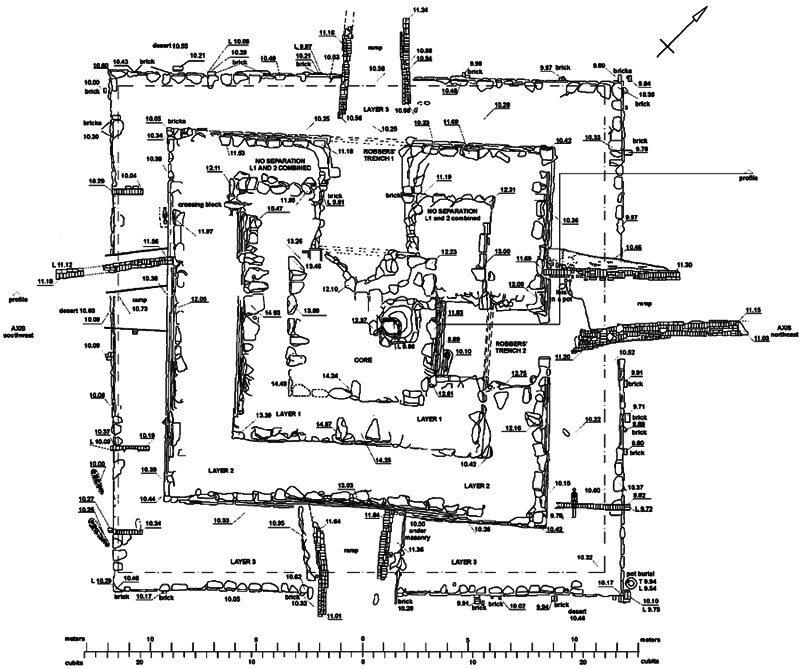 At the layer step pyramid of Sinki planning was by means of brick markers discovered. They were placed to serve as reference points to orientation, alignments, inclination, and other building features. Brick alignment markers are also noted on the east side of the Layer pyramid at Zawyet El Aryan. The building material is usually brought from sources close to the site. All pyramids are built of stone from the nearest quarries, thus: granite at layer step pyramid of Elephantine, sand stone at layer step pyramid of El Ghenimiya and limestone for all the other pyramids. When fine stone is needed: for the lowest course of the outer facing, the outer facing itself and the pyramidion in the superstructure and for the sarcophagus, portcullis and some inner chambers in the substructure. Their quarries and sources are deep in the desert or far upstream. In all cases transportation is needed. Preparing pyramidions and sarcophagi required higher skills. Quarrying is a skill which has existed during all phases of human civilizations. In Egypt the quarries are numerous and their output had to be transported - we are talking about solid blocks weighing from less than one ton to hundreds of tons. In Ancient Egypt the preferred quarries of limestone were in Middle Egypt, sand stone in Upper Egypt and granite from Aswan. Most preferable were those closest to the banks of the river. As for diorite, quartzite, shiest, breccia and rare stones, they were quarried from far locations. These also had to be brought to the river for transportation. Mining copper and other metals for tools came from remote locations in Sinai. The quarried blocks and mined metal had to be brought to the river, loaded on barges which sailed downstream. On arrival to the river banks closest to the destination, unloading takes place. The safety of the Nile cruise varied during the 3 seasons; in the flood season there was the danger of drifting and in the harvesting season there was the danger of grounding. Yet there was a sudden danger of flash floods rushing down from the eastern desert. 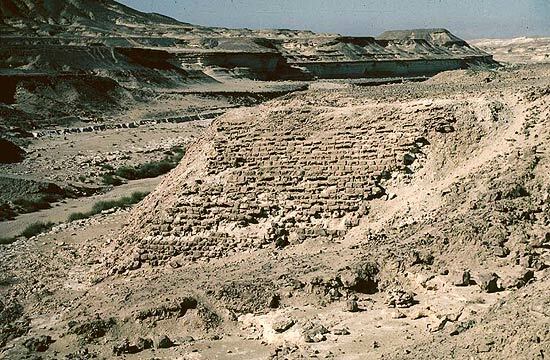 We have observed that for the safety of sailing and unloading the stone supplies at Dahshur and Giza, the Ancient Egyptians of the 4th dynasty, built a great dam across Wadi Garawi (pictured below), in the east desert to ensure the safety of the transported loads from the flash flood. The unloading takes place on the flood plain level and the building site could be close or far (may be a few kilometers). The chosen site of the pyramid project is usually on the desert plateau which was 30 to 60 meters higher than the flood plain. These are important problems that have to be solved before the first block is set in the project. Remains of the Dam at Wadi Garawi south of Helwan; it dates to the 4th dynasty 2600 BC. Nabil Swelim 1990. Once the blocks are at the building site, they are built in their final position in the edifice. As the pyramid grows the blocks are lifted higher and higher. We have remains of a ramp discovered south of the queens of Khufu at Giza (pictured right). Four ramps at the small unfinished layer step pyramid Sinki at Abydos. Herodotus reports mechanical lifting by short blocks of wood. Every now and then a new idea turns up, unfortunately hitherto nothing is conclusive. All these activities were achieved with the intensity required to complete the project during the lifetime of the king. Retaining walls of a ramp at the pyramids of the queens of Khufu near the Sphinx. This ramp was cleared of the filling between the walls. The ramp was probably constructed for building a small pyramid (G1X) 50 m away to the north. The pyramid was discontinued at a very early stage. It is close to the shaft of Queen Hetepheres, the mother of King Khufu. Tarek Swelim 1991. 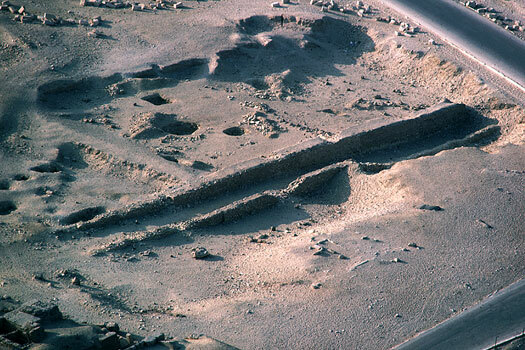 An aerial view of layer step pyramid Sinki (click to see diagram) at Abydos shows the construction ramps on the 4 sides of the unfinished monument. They were starting from the desert surface over the foundation of the outer facing (layer 3) and leaning on the nucleus (layers 2, 1, and the core). Redrawn by Nabil Swelim 1990.